Southwestern College is accredited by The Higher Learning Commission (HLC). Established in 1895, HLC is one of six regional institutional accreditors serving the North Central region of the United States. Degree programs and licenses in Education are regionally-accredited by the Council for the Accreditation of Educator Preparation and the Kansas Department of Education. Southwestern College is also accredited by the Commission on Collegiate Nursing Education. Southwestern is further accredited by the University Senate of the United Methodist Church and other accrediting bodies for individual majors. Southwestern College is a proud participant in the U.S. Department of Veterans Affairs Yellow Ribbon Program and Principles of Excellence, offering portable degree programs to assist veterans with accelerating their careers. Veterans can utilize the various Chapters of the GI Bill® to pay for tuition, and depending on the GI Bill® Chapter, eligible veterans may be able to obtain a degree with no out-of-pocket expenses. 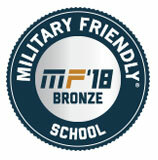 Credit is awarded for military education and training including CCAF, JST, DANTES, and ACE-evaluated training.